Look! 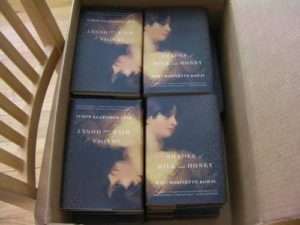 My author copies of Shades of Milk and Honey arrived today. We are also eight days away from the release day of August 3rd. Not that I’m counting. 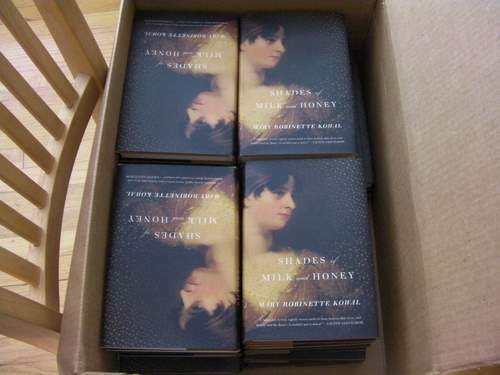 To celebrate, I’m going to give away two signed copies of Shades of Milk and Honey. How do you win? 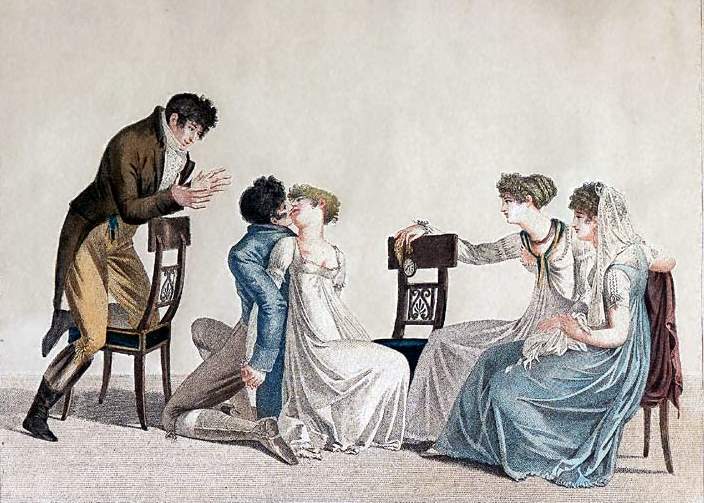 Between now and August 1st post a caption in the comment thread on my website to go with this illustration from 1800. On August 2nd, I’ll open a poll with the various captions listed and give a copy of the novel to the most popular caption AND to my personal favorite. Edited to add: Yes, you may enter more than one. However, with this addition I’ll narrow them down to my top favorites before posting the poll. Hurrah! From the August issue of Romantic Times comes this really lovely review of Shades of Milk and Honey. If Jane Austen had written a fantasy novel, Shades of Milk and Honey would have been the result. Written with painstaking attention to detail, Kowal’s prose is serenely evocative of the time period, and the fantastic elements are a seamless fit. The characterization is extremely well done and Jane is a sympathetic, strong and intelligent heroine whose devotion to her family trumps nearly every other concern. Give this one a try! In an alternate Regency England where magic exists, young women practice manipulating glamour in their quests to land eligible bachelors. Both Jane and her sister Melody are well-practiced in this womanly art, and Jane’s ability in particular is remarkable. However, it is Melody who is fair of face and who gets most of the masculine attention while Jane, at the age of 28, is on the shelf. When I was trying to decide what garment I wanted to have made to go with my Regency dress, I was waffling between a pelisse and a spencer. I spent a lot of time looking at the book Revolution in Fashion: European Clothing, 1715-1815 which has really gorgeous photos of the Kyoto Costume Institute’s collection. Really, really gorgeous. We eventually settled on a spencer, but in the course of looking at reference photos I ran across this picture of a pelisse. 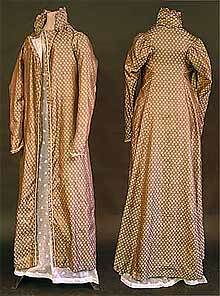 Actually, not just any pelisse, but one thought to have been worn by Jane Austen. Take a second and click through to the Jane Austen Centre to read about how they came by the pelisse and why they think it might be something she wore. The article discusses everything from what colors were fashionable to diary references to the pattern of oak leaves on the fabric. The reception for Shades of Milk and Honey‘s debut at NASFIC will feature Regency costumes, beverages, desserts (including the legendary poundcake baked by authoress’s mother) as well as party favors, readings, music, and a shadow puppet show in miniature. If you are unable to attend, please be assured that festivities will take place in other cities as well. 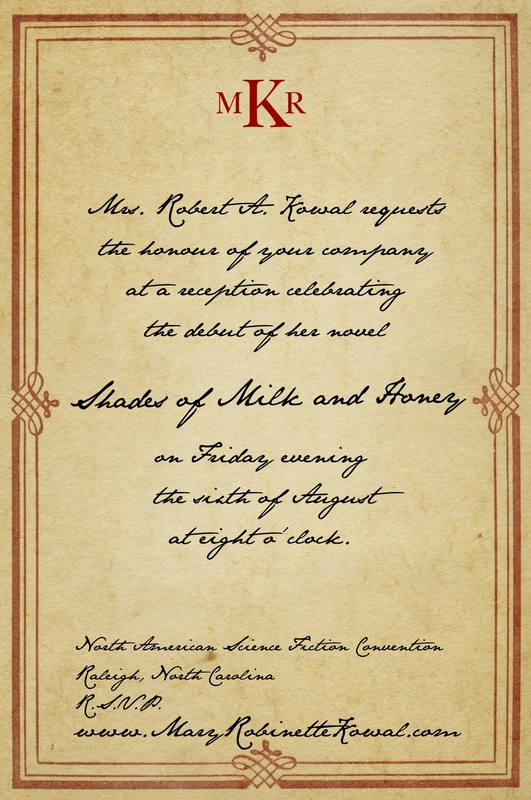 Mrs. Kowal profoundly hopes that you will honour her with your company. I have a copy of Shades of Milk and Honey. An actual, physical copy of the finished hardcover. Of course, my phone chose this evening to have a card failure so I can’t actually take pictures with it, but Jim Freund snapped this one in the bar to prove that it exists. The reason I am blurry is that I am bouncing with glee. I have no idea what the rest of the email said. The way the trains work, there was no way I could get to Tor before she left for the day, so I asked Liz, my editor, if she could bring me a copy at Readercon, which she promptly agreed to do. And yes, that would by Cassie, who lives two blocks from the friends that I’m staying with. If only I had known! Cruel fates. I could have had a copy last night. But… I’m a big girl. However, this led to me spending the entire day at Readercon, looking distractedly over people’s shoulders in case Liz walked by. Distractedly. Very, distracted. One person ran out to stop her as we all sort of scrambled around as I clambered out of the booth. You know how there’s that deep corner where EVERYONE has to move to get one person out? Yeah, that’s the corner I’d wound up in. I ran down the hall as she pulled it out of her suitcase. I mean, I’ve loved books all my life. And not just the words, but the physical artifacts. And then… I wrote this. God. I can’t even believe it. And folks, it is beautiful. You’ve seen the cover. What I can’t show you right now is the deckled edges of the paper, or how, when you peel the dustjacket off, there’s an embossed design on the cover, or the miniature on the back, or the way the headband complements the brown paper of the hardback. So thank you to Irene Gallo, Terry Rohrbach and Nicola Ferguson who created this beautiful artifact. I know it’s your job to design books, but you have made me indescribably happy. As we’ve noted, it is hot here. If you are going to be at Readercon this weekend, come find me because I have a solution in hand. 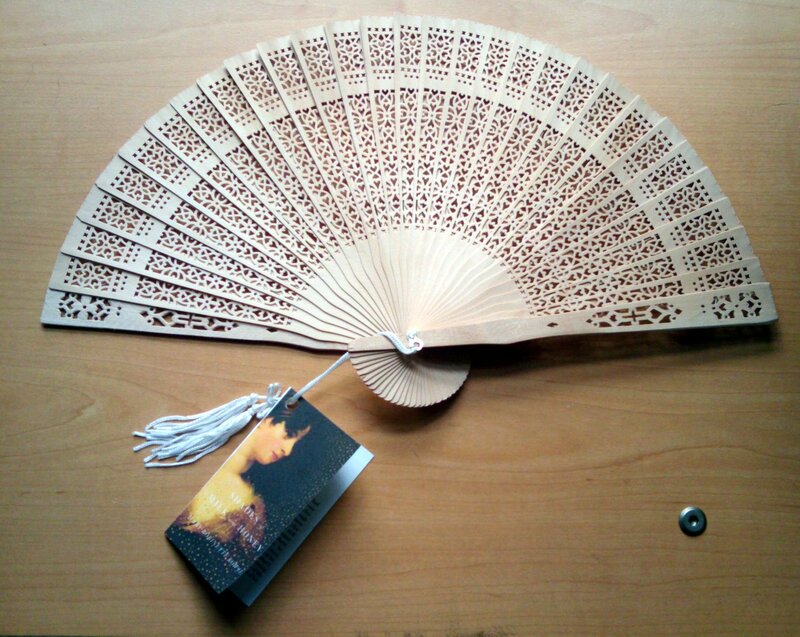 Allow me to introduce you to the Shades of Milk and Honey promo item. I brought 144 sandalwood fans with me, each with a dance card that has the cover art and the first page of the novel. I’ve got 1000 of these, that I’ll be passing these out at conventions and readings all summer. So find me if you want a Shades of Milk and Honey fan. To celebrate that, we’re releasing the first chapter as a sample. You may download it to read in .pdf or .epub or read the sample chapter below. I’m sitting at JFK and there is some question about if I will be flying out tonight. The flight is oversold and late. They are offering me a voucher and to fly me straight to Seattle tomorrow, in time to arrive for the Locus awards. We’ll see what happens with that. We talked about audio books, e-book readers, radio theatre and I read part of the first chapter of Shades of Milk and Honey. Readers will be disappointed only when they finish this enchanting story, which is suffused with genteel charm. The author’s judicious and effective changes to aspects of daily life clearly communicate how similar but different this world is from ours. With the grace of SENSE AND SENSIBILITY, a touch of classic fairy tale magic, and an action-packed ending, this debut novel by an award-winning short story writer will appeal to fans of Jane Austen, Jane Yolen, Patricia Wrede, Susannah Clarke, and even Jasper Fforde. I spent another 4 hours locked in the box last night, recording Shades of Milk and Honey. When I came out of the booth, my voice was morphing between my natural voice and my British narrator voice. It was very odd. Even odder, and frankly disconcerting is that, as I am writing this, my voice in my head is stuck in British mode. I haven’t spoken yet today and wonder what will come out of my mouth. Curious. I’ve not had this experience before but then, I’ve never spent this long speaking with another voice before either. This is not to say that I don’t still need a dialect coach in the room, but by the end of the evening Roz was needing to stop me less. The bath-trap split still gives me trouble occasionally, but is starting to become a bit more instinctive. Overall, this is going slower than previous books largely due to dialect corrections. I am hopeful that as I settle into the voice the pace will pick up. Good heavens. I think even my syntax in writing is shifting. Odd. I should probably go write some witty banter in a detective novel while I’m stuck like this. One of the other odd things about recording one’s own work is that I can’t blame my stumbles on anyone other than me. Why are some of these sentences so long? Did I really have to choose words that I have never said aloud? Why are there so many characters in some of these scenes? I dread the straw-berrying picking party already… Ten characters? Really? What was I thinking? Edited to add: I just greeted Rob and sound mostly normal, although perhaps my voice is placed slightly farther to the front of my mouth. Slight vowel shifts but overall, I still sound American. I think this might be my favorite review of all time. Dan Wells, author of I Am Not A Serial Killer. Apparently, Shades of Milk and Honey has left him somewhat irked. It’s a shame, because this review just makes me giggle. 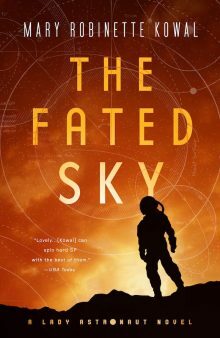 Here’s the problem: Mary Robinette Kowal is too good. Not only is she famous, and gorgeous, and brilliant, she’s also a really good writer. This cannot be allowed. I tolerated it before, when it was just award-winning short stories, but her new book Shades of Milk and Honey is too much: clever and simple at the same time, with an unerring sense of historical yes-that’s-exactly-right-ness, and a mastery of craft and form belying the fact that she, like her characters, pretty much created the form out of nothing. To write a book I enjoyed this much, in a manner so talented I could never hope to recreate it, can only be considered a personal insult. Next time I see you, Mary, you’re dead. He goes on with the review which, besides being very funny, exactly gets what I was trying to do with the novel. The quibbles that he has are, I think, perfectly fair which also pleases me. 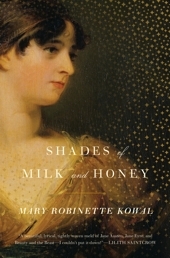 Go read his review Shade of Milk and Honey, or, Why I’m going to murder Mary Robinette Kowal. Oh, and you should buy I Am Not A Serial Killer which will hopefully mitigate his anger and allow me to live. Also, it’s really good. We had our first recording session for Shades of Milk and Honey last night. I’ve recorded my own short fiction before, but this feels quite different. Part of this is the length. Most of it is that I’m recording in a British accent. I have a fairly decent one according to the native speakers I’ve trotted it out for, but I’ve never sustained it for something this long. To keep me on track, we’ve engaged a dialect coach, Rosalind Fell, who is a local British actor. She is flagging when I drift out of RP (Received Pronunciation or BBC English). For the most part that’s when I hit R too hard or the various difficulties with the letter A. The R is funny. One of the primary components in many Southern accents is a soft or dropped R. Instead of Horror, it’s Horruh. So on the one hand, that’s a very familiar place to go. On the other hand, I had a speech impediment when I was little which involved not being able to pronounce the letter R.
I was in speech therapy and had it trained into me that this was a sound that one must pronounce. There are still letter combos that are hard for me, like the above mentioned Horror but largely I do the R naturally. Which means that dropping it for an entire novel just feels odd. The other vowel shifts are easier to manage. Occasionally we also have to correct the emphasis, which is sometimes on different syllables across the sea. The real fun comes when we hit a word that none of us have ever said aloud. Last night’s stumper was “simulacrum.” I’m happy to report that the dictionary was helpful however, I’ll be taking the link for http://www.howjsay.com/ in to work with me tonight. Lord knows what other words I’ve tossed into the mix. The other odd bit was that I use the Austen spelling of “shewed” for “showed,” and the speculation is that this was closer to how it was pronounced then. We decided to give it a modern pronunciation since I’m not doing a period 19th century accent anywhere else.